Pre-requisite: if you are learning from scratch and haven’t yet learned HTML Forms, head over there first and then come back! This tutorial on how to style your forms using CSS will build on that tutorial (or previous knowledge). Okay with that out the way, let’s get started. Despite new technologies such as Social Media Sign-in and voice search (e.g. Siri or OK Google) form are a necessary part of the web. From enquiry forms, to email address captures, to your online banking, the need to enter information is the longest-standing method of adding user interaction to a website. The problem is that forms, if not styled (or designed) are both boring to use and boring to look at. And if your forms are dull, you could lose enquiries, sales, sign-ups or whatever your key conversion metric is. But the reality is that without using CSS, your forms will look ugly! So we are going to look at some simple CSS styles that can help bring a consistency to your forms and give you more control over your form design. Since the birth of HTML5, the number of single-line inputs has grown from just <input type="text">. For example type="email" and type="url" are now valid ‘text’ boxes but do not allow the form to be processed until the correct format has been supplied (dependent on browser-support). By using the input[type="text"] we can target any HTML tag that has <input type="text">. This format can be used to target any input type, including the new HTLM5 input[type="date"] for example. Because we have used a comma list, we can apply the same rules to all items in the list. We have used CSS Padding to make sure the text doesn’t hit the edges of our box and border-radius to give them a slightly rounded corner. Note: you may have to define your font-family for inputs and often the browser will use its own defaults if you don’t. In the case of the width you will have to tweak this for your specific form. In my case it was easier to set my HTML Table as an abolute size (in pixels) rather than a relative size (in percentages). Then I could tweak the width until it was right. For height, a select box ignores line height so I just needed to create a new line for the select input type and adjust the height. Because TextAreas are not an input tag, they will need defining separately. Because CSS Cascades, you can still apply the rules for the input types to a textarea and then make any tweaks you need to. In HTML, <textarea>s have their width set by the cols attribute, which gives a different width depending on the relative size of the font letters in your typeface. This can lead to inconsistent widths between a text input and a textarea. For consistency, it’s good practice to keep form elements the same width where possible..
A strange behaviour of textarea tags is that they usually have a ‘fixed-width’ font by default – such as ‘Courier New’ for example. This means you will need to set a font-family on your textarea to make it the same as your single-line text boxes. Whether you link to Google Fonts or use @font-face you will still need to add it to your textarea definition. Many browsers now allow users to resize a TextArea. This can be helpful if people want to see more of what they’re typing at once. But you may want to re-control this and stop this behaviour. To prevent resizing on your text area tags simply add resize:none; to your CSS. Control Your Borders: If you do not define a border attribute in your CSS, then each browser will add one and that can look different across different browsers. So you should define your own border, or in this case, set border:0; so that your User Interface (UI) looks consistent regardless of device or browser! The cursor Attribute: only relevant for desktop/laptops of course, but if you want make it obvious that your button is something to be interacted with, then cursor:pointer; changes the cursor from an arrow to a ‘pointing hand’ icon. There are other values for cursor but they’re beyond the scope of this tutorial. The last bit I will cover in this introduction to Forms and CSS is how to add some interest into the currently-selected form field. This makes use of CSS pseudo-elements. So far we have just looked at affecting HTML tags with CSS. I will do a more in-depth tutorial on pseudo-elements later, so this is a quick introduction. You can apply this to most other form elements if you want, to help make it clearer which form element someone is about to click into. This is a huge topic and this is just an introduction to it. But hopefully you have learned enough here to go away and have a play around with the code yourself. You can download the demo file by pressing the button below – play with it to your heart’s content. 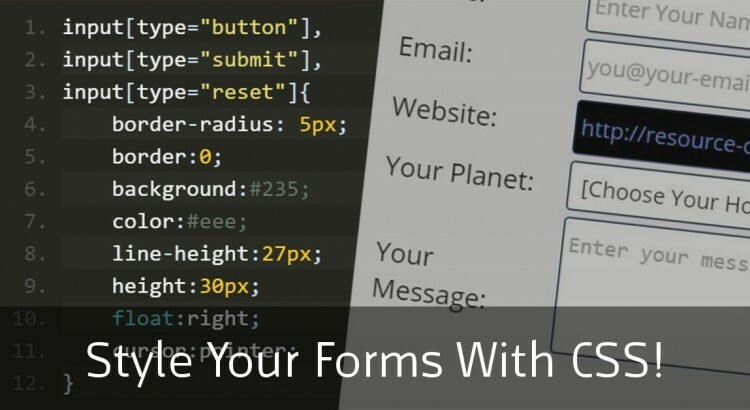 At the end of the day, you want to make your website’s forms interesting and interactive. Doing so makes the likelihood of someone filling out your form greater and keeps people on your website longer, which can only be a good thing! If you have any questions, feel free to use the comments and I’ll do my best to reply. Happy Coding!